For your information, the text of the ARRL's Petition for Rulemaking to the FCC to permit AMTOR (CCIR Rec. 476-2) in the Amateur Radio Service is quoted below. 1. 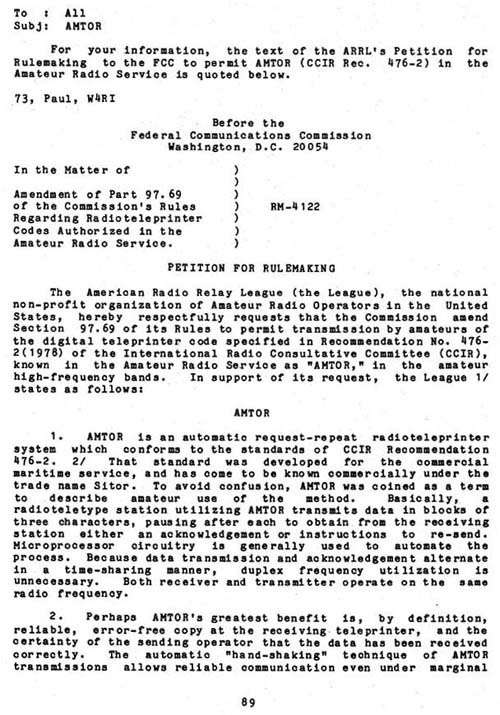 AMTOR is an automatic request-repeat radioteleprinter system which conforms to the standards of CCIR Recommendation 476-2. 2/ That standard was developed for the commercial maritime service, and has come to be known commercially under the trade name Sitor. To avoid confusion, AMTOR was coined as a term to describe amateur use of the method. Basically, a radioteletype station utilizing AMTOR transmits data in blocks of three characters, pausing after each to obtain from the receiving station either an acknowledgement or instructions to re-send. Microprocessor circuitry is gene rally used to automate the process. Because data transmission and acknowledgement alternate in a time-sharing manner, duplex frequency utilization is unnecessary. Both receiver and transmitter operate on the same radio frequency.